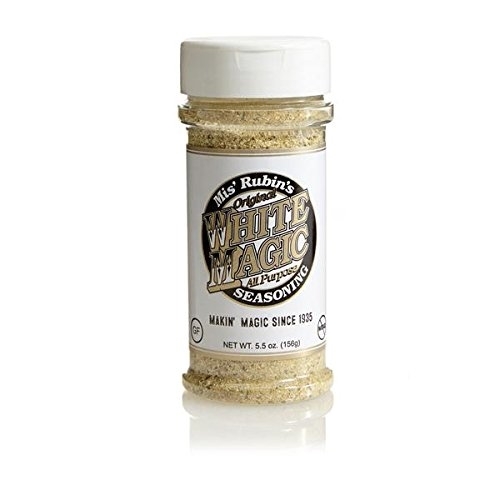 White Magic chicken rub and vegetable seasoning has been a household staple in the south for over 80 years. White Magic is known for its unique savory flavor with just a hint of citrus that harkens back to the founder’s Greek roots. This savory spice mix is so tasty it even makes vegetables taste good. Use it on your potato dishes, greens, grilled onions, peppers, corn on the cob, cauliflower, beans, and more. This Alabama dry rub uses only the finest herbs and spices and none of the bad stuff. 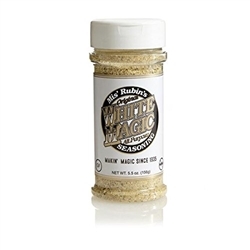 White Magic All Purpose Seasoning is Gluten Free, No MSG, Low Sodium Seasoning. Stock your kitchen pantry with wholesome goodness. This southern take on Greek seasoning creates the perfect amount of savory flavor on any meat with a slight hint of citrus. The strength of White Magic is its versatility. It’s truly an all-purpose seasoning best served as a dry rub on fish, seafood, vegetables, grilled chicken, poultry, pulled pork, chops, and pork tenderloin. It’s also the perfect complement to salads, pasta, casseroles, soups and more. White Magic will take your gourmet southern comfort food to the next level. It’s even great as a popcorn seasoning!